Let’s get one thing straight- this cheesecake is delicious all by itself. Nutty crust with hints of sweetness in each bite from the dried cranberries, then topped with a smooth white chocolatey filling- yep that’s about all you need in this life. Unlesssssssss, you’re going to add salted caramel sauce on top. Woah. Just when you thought it couldn’t get any better. 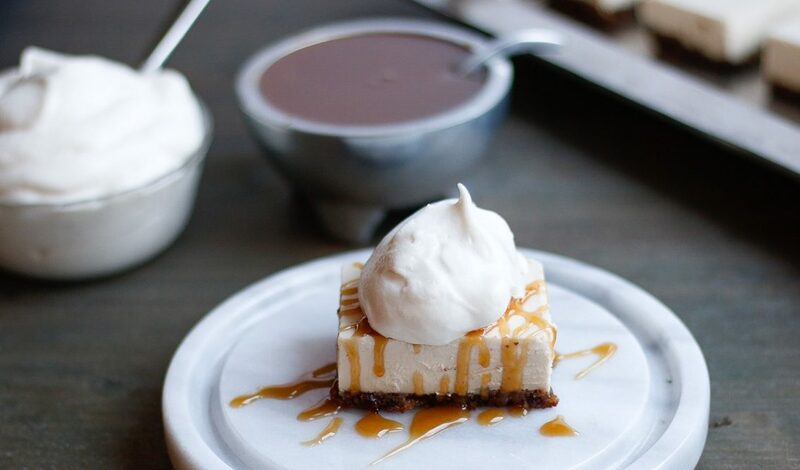 Salted caramel is EXACTLY what this cheesecake is begging to be drizzled with. But thennnnn, (I feel a bit of If-You-Give-A-Mouse-A-Cookie coming on) I decided to throw a dollop of coconut whipped cream on top of this vegan salted caramel cheesecake and Oh My God *Janice voice*. Perfection. Simply perfect. No bite is more delicious than one that grabs the crunchy bottom, thick velvety center, sweet and salty gooey caramel, and fluffy, rich whipped topping. Case closed. It doesn’t get better than this. Guess what? This is yet another recipe I’m trying to duplicate from a restaurant in Montreal. But this was no ordinary restaurant, this was a CAT CAFE! (aka: the coziest place ever). I’m so lucky I had roommates who liked cats, because I definitely needed someone to share in my utter delight the first time we walked into this place. Picture it: Cozy reading chairs, big working lunch tables, all vegan salads, pizzas, sandwiches, a cooler full of *incredible* vegan pastries, and kitties wandering everywhere just waiting to be loved on. Sound like heaven? I thought so. If you’re not a cat person, I may have lost you by now. Oh wait, still here? Ok, I’ll get to the point. When we first discovered this cafe, we had actually just come from lunch, so in order to be able to stay and play with the kitties, we ordered some dessert. I chose the cheesecake with a caramel drizzle on top, and my life was changed forever. Not only was it delicious, it was the best cheesecake I had ever had- even compared to the 99 flavors they offer at The Cheesecake Factory. Best part? It was vegan! Mind blown. 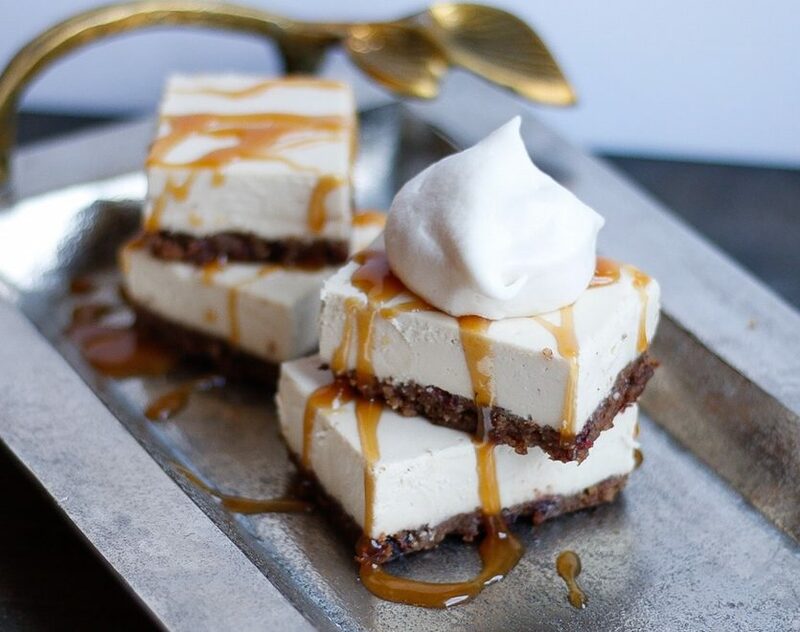 The vegan cheesecake with salted caramel sauce at this cafe and the Salted Caramel White Chocolate Almond Cookies from Cafe Neve in Montreal are two of the most amazing desserts I’ve ever had, hence they were the top two things on my list to replicate once I got home. I’m really struggling with the cookie, simply because I find it hard to veganize these in general, as it is really hard to accurately replace the taste and texture of butter and eggs when baking cookies. But when it comes to the cheesecake, I think this version is pretty dang close. Of course, each time I make this I’ll probably make some tweaks, as almost all recipes are constantly a work in progress. One difference I do notice is the cheesecake in Montreal seemed to have just a slightly lighter texture to the filling, so I’ll keep playing with that. 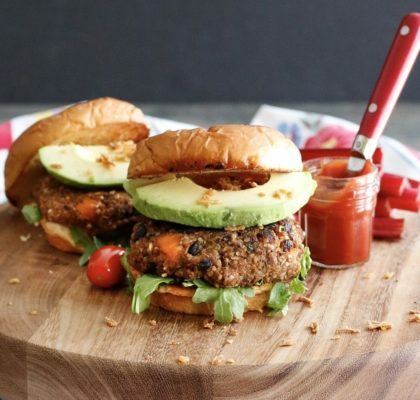 But for now, vegans and non-vegans alike have been gobbling this up! Most of the flavor for the filling comes from cacao butter. Cacao butter sounds familiar, eh? (I may have picked up a thing or two in Canada besides recipes 😂) Yep, cacao butter is that silky ingredient you find in many of your lotions and body washes. But not just a great moisturizer, it’s tasty too! Cacao butter is the base of most chocolate bars, thus by itself, the cacao butter gives this cheesecake a slight white chocolate taste. 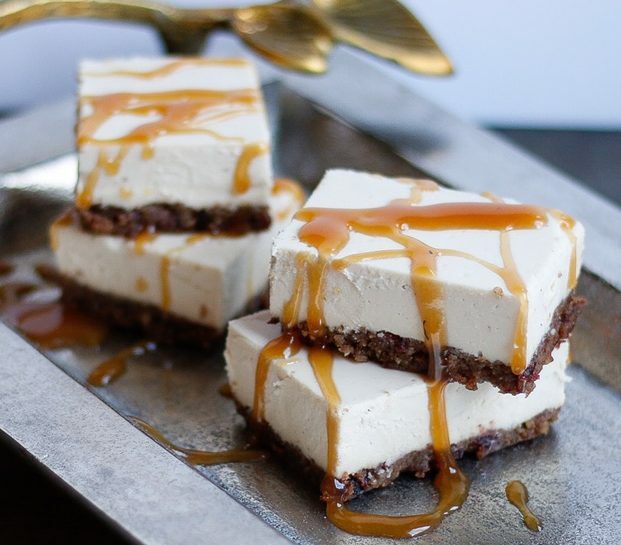 I personally, don’t love the taste of it plain (so don’t be turned off if you don’t like it before blending with the other ingredients) but it is EVERYTHING in creating the flavor profile of this Vegan Salted Caramel Cheesecake. If you click the link below you’ll see cacao butter is kind of expensive. However, it will last you a long time. Although most packages advertise it as a moisturizer, so long as it is “food grade” you can use it in the kitchen or as part of your beauty routine. Cacao butter is touted for its anti-aging properties, due to its high concentration of antioxidants that combat oxidative stress from creating wrinkles and age marks. It can also help reduce inflammation and the appearance of scars on your skin. Cacao is really a fascinating ingredient in all forms- I talked more about its benefits here. 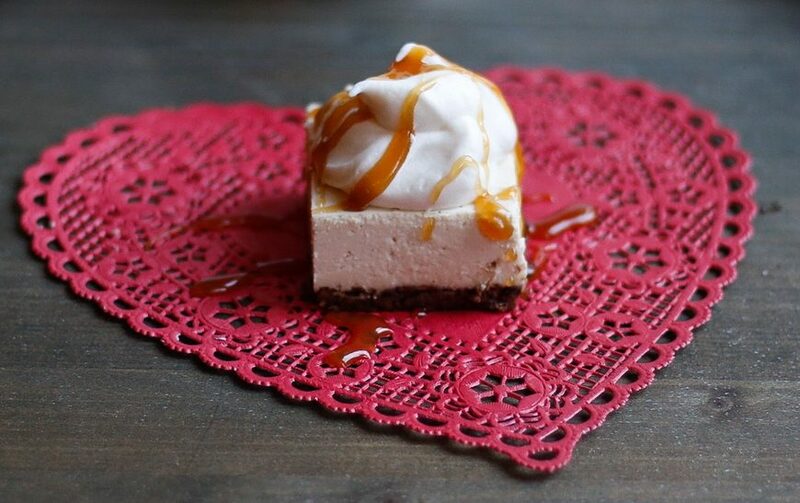 Vegan Salted Caramel Cheesecake is the perfect Valentine’s Day dessert! 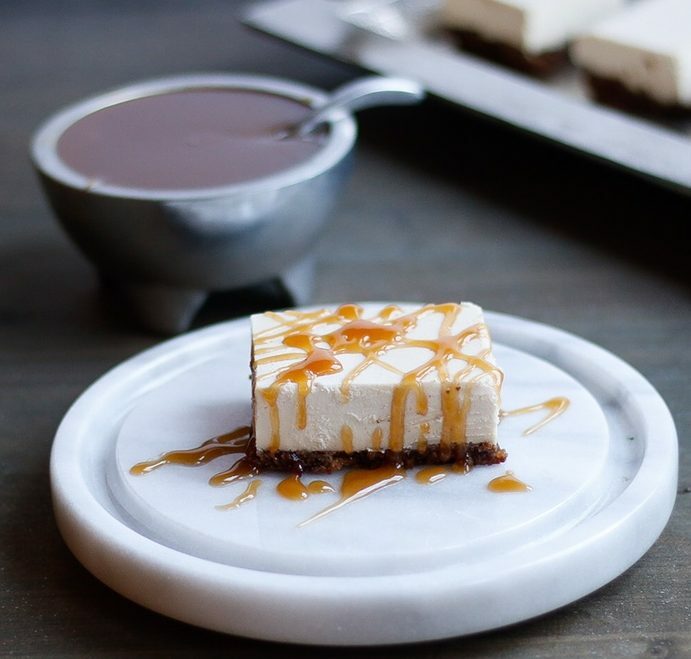 Even if you don’t make this cheesecake (although, I really think you should) you MUST make this salted caramel sauce! It is to die for. 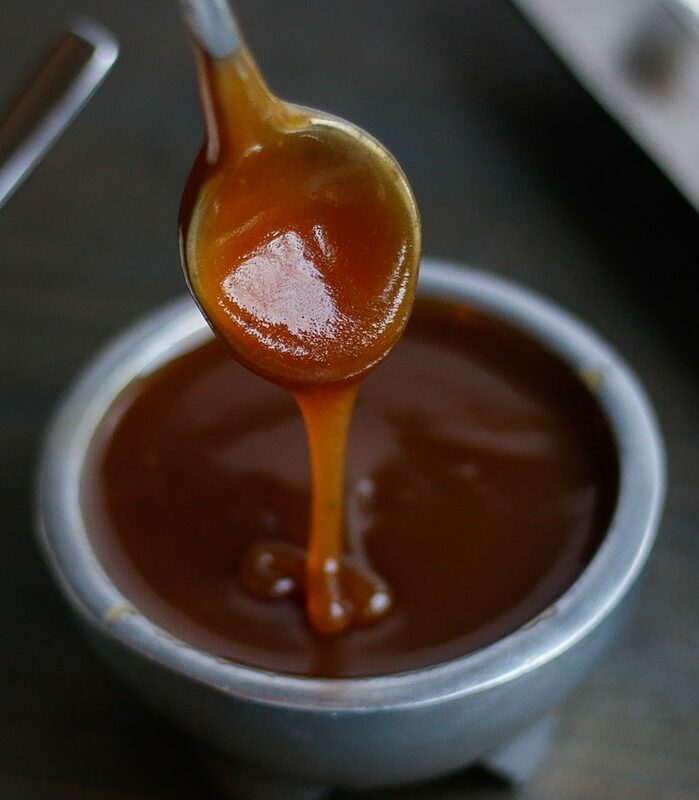 It’s a total fluke that I ended up using part brown sugar when I went to make this, but the subtle depth of flavor it gave to the caramel was incredible. I will always split my sugars from now on! Do you see that gooey drip? Your mouth could be where that bowl is if you go make this right now…just sayin’. Ok, to top this all off I recommend coconut whipped cream. I was SO hesitant to make coconut whipped cream a few months ago because I’m not a huge coconut fan- but this stuff is what dreams are made of. It is magically thick yet fluffy, and if I’m left alone with it, it just might disappear. It’s really simple to make (I describe below) and all you need is a can of coconut cream, powdered sugar, and vanilla extract. Note: Coconut cream is different that cream OF coconut, so be careful when shopping. Trader Joe’s brand is my favorite! Ok, it’s time to get cooking- can’t wait to hear what you think! Soak the cashews or boil them until very soft. For the crust: Preheat oven to 325F. Pulse the pecans, sugar, and sea salt in a small food processor until roughly chopped. Add in the cranberries and pulse several more times until the pecans are not quite fine, but still very small. Finally, add the milk in 1T at a time, pulsing in between each addition, stopping once the mixture comes together into a dough. (Be slow with your milk so it doesn’t get too wet!) Line an 8×8 baking dish with parchment paper that hangs over the sides. Press the crust into the bottom of the pan, then bake 15-20 minutes, until golden and lightly crisp. Remove from the oven and let cool. Meanwhile, in a high powered blender combine all the ingredients for the filling. Blend until perfectly creamy (this may take a few minutes). Adjust citrus, sweetness & salt to taste. Pour batter over the crust, the refrigerate at least an hour or until ready to serve. When ready to serve, use the edges of the parchment paper to pull the entire cheesecake out of the pan, before cutting into 9-12 squares. 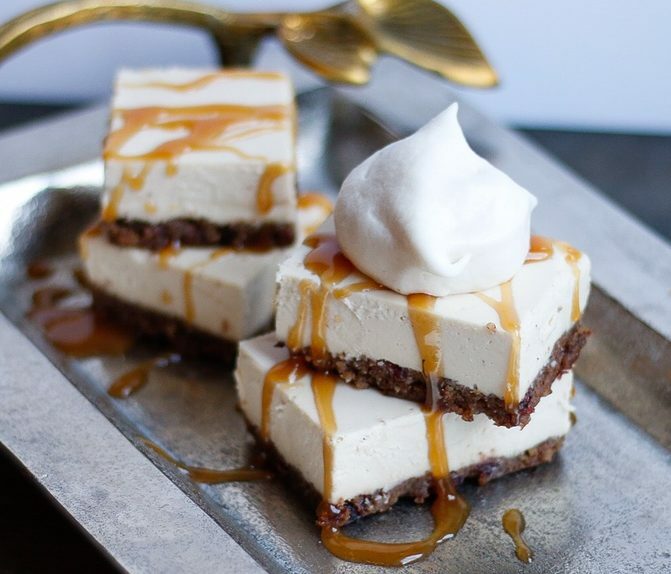 Drizzle with caramel, dollop with cream and enjoy! Store any remaining cheesecake in the fridge. Method: Once the cashews are soft either by soaking or boiling, place them in a high powered blender with 1/2 cup of water. Blend until very very smooth (you don’t want grit in your caramel!) 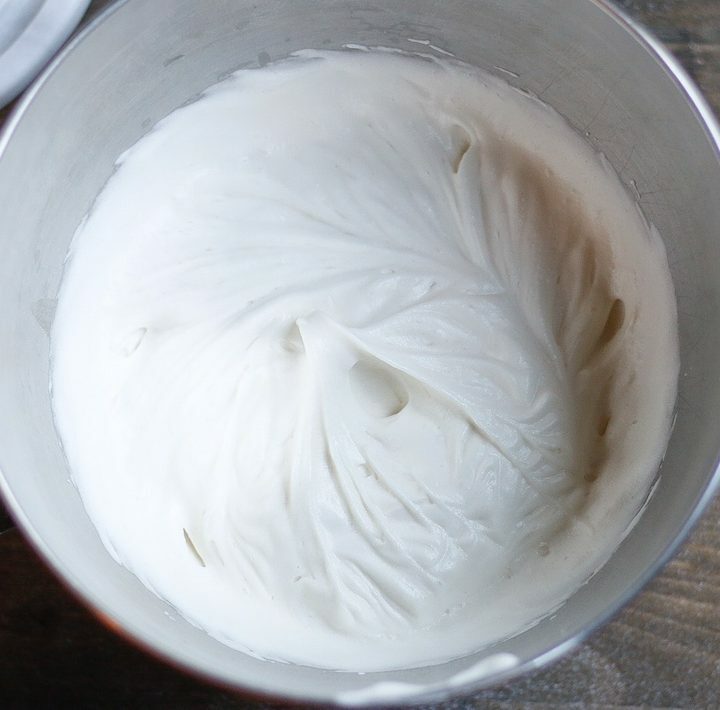 Add more water if necessary to get the cream to a velvety consistency. You should have about 1.5 cups of cream once finished. Next, in a medium sauce pan, add the sugars over medium heat, stirring constantly with a spatula or whisk. The sugar will start to form clumps as it melts- keep stirring so it doesn’t stick to the bottom or burn! Eventually the sugars will melt into a dark brown liquid, at which point you should carefully stir in the cashew cream. Bring the mixture to a boil for 1-2 minutes, then remove from heat as you stir in salt and vanilla (if using). Store in a glass container in the fridge. (It will solidify more as it cools). This can be made 3 days in advance. Method: Chill the coconut cream in the fridge overnight, with the can standing straight up, so the cream will separate. When ready to make, chill your mixing bowl and beater in the freezer for 10 minutes. Then, open the can of coconut cream, scrape out the hardened cream on top and transfer to a mixing bowl. Leave behind any liquid at the bottom of the can (You should use about 3/4 of the can- if less than that solidified, you may have gotten a dud). Beat the hardened cream for 30-60 seconds. Add the vanilla and powdered sugar, and beat another minute or two until fluffy and smooth. Add more sweetness to taste. *Try* not to eat it all by the spoonful before dessert, and store in the fridge until ready to serve. 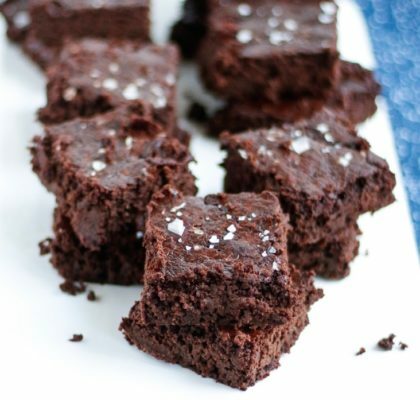 *I’ve made this with 1/3 cup and 1/2 cup of cacao butter. The flavor is pretty similar, but the texture is just slightly less firm when using 1/3 cup. Sounds deeelish! 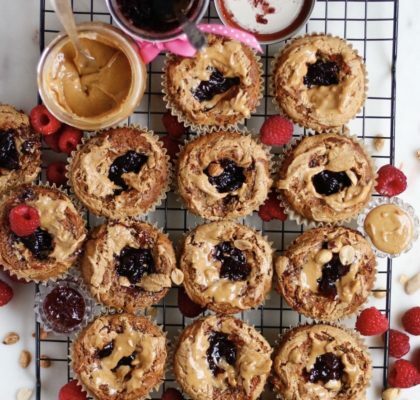 Can I sub the cacao butter for coconut butter? 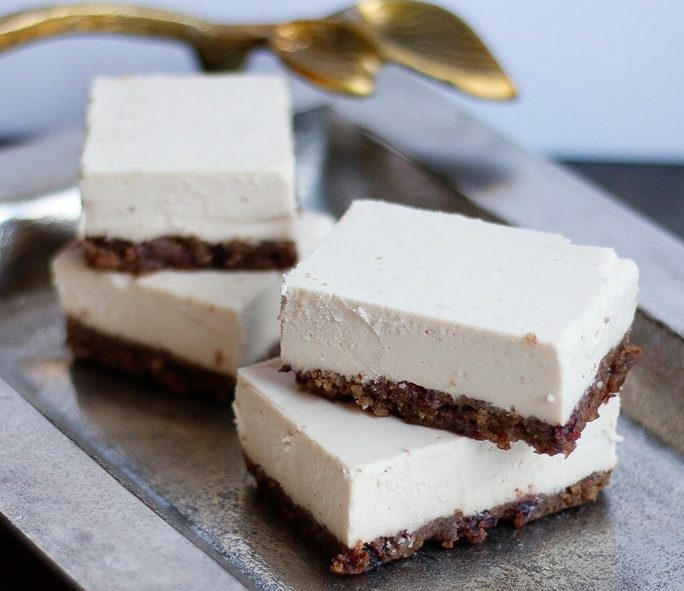 The cacao butter gives the cheesecake a sort of white chocolate flavor that is amazing! I haven’t tried coconut butter, but I’m sure it would work great! It will definitely add a coconut flavor, though. Enjoy!